I had just finished emailing my swap partner a quick note when I went to get the mail. There on my steps was this wonderful package. 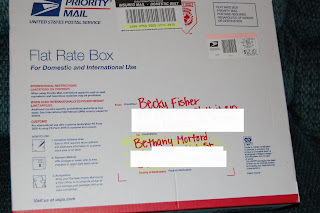 It was the favorite things package from my swap partner Becky over at Our Incredible Happy Family. I was so excited! This was the first swap I had participated in, and I couldn't wait to open the box. First, there was this letter. Mamarazzi does a super job when she matches people up. Becky and I have both been extremely busy in the past weeks. She is in the middle of a move, and I was tying up the loose ends of a school year. Becky's letter apologized and said that there wasn't much cuteness involved, but her adorable writing is cuteness enough for me! Becky sent me all kinds of goodies! 1. A Photo Album - this is so adorable, and I am sure that I will fill it up with lots of pictures. 2. A notebook - I sent her something very similar. I love to write and jot down notes and ideas. She does also. 2. A Scrapbooking kit - This is so adorable! I should have taken a close up picture for you. It has two canvasses to decorate, and all the stuff to decorate them with! 4. Star Candles - I love candles, and these are just beautiful! 5. Coupon organizer - I just started couponing a couple of weeks ago. So far, I had been using envelopes to organize all my coupons, but I am loving this! Thank you, Becky, for being a great swap partner! I love all the things you sent me, and can't wait to hear what you think of what I sent you. Be sure to stop by Mamarazzi;s blog and check out the other great loot! YAY what a fun box of favorite things goodness! i am glad the match was spot on and that you have made a new bloggy friend! this maks me happy! did you vote for the theme for my next swap? there is a poll on my sidebar...check it out! What fun, this swap is so much fun! Cute and very usable things! I love your goodies! Mamarazzi's swaps really cannot be beat. Such a wonderful way to connect bloggers with one another, Bethany. Looks like you received a fantastic package in the mail. Thanks so much Bethany for a wonderful swap! I love all my goodies!!! I LOVE Mamarazzi's swaps!! I missed out on this one though. Rats!! !